"After losing their families, it's all they have." When a group of vervet monkeys came across a farm in the Democratic Republic of the Congo, they started taking some of the crops for their meals. But the local farmers saw the monkeys as pests who were stealing the crops from the farm - and violence broke out. It's believed that a few of the monkeys of the group were killed. 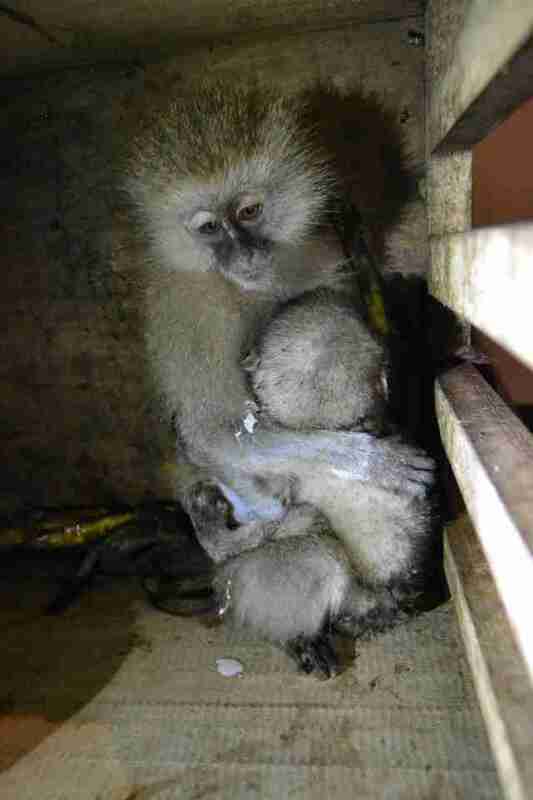 The locals took captive two of the youngest monkeys in the group, now named Makobola and Fizi. Makobola is estimated to be 2 or 3 years old, but Fizi was so young when he was captured that his teeth hadn't even come in yet. 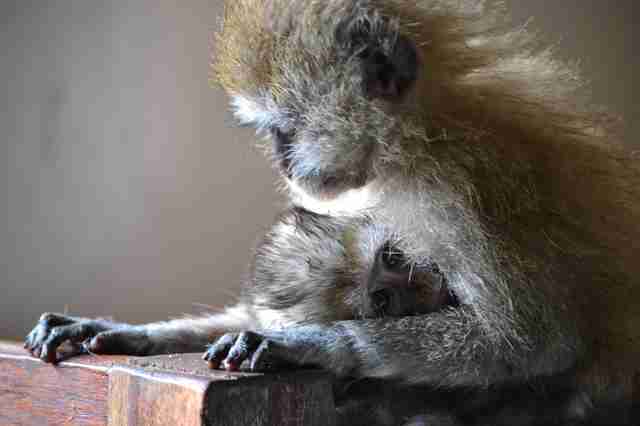 "We think the Fizi's mum was killed, because there is no way you can take a baby like that from his mum," Itsaso Vélez del Burgo Guinea, technical director of the Centre de Rehabilitation des Primates de Lwiro (CRPL), told The Dodo. Luckily, a policeman saw the local people with the two young monkeys, and bought their freedom. He took Makobola and Fizi to his house initially - he even considered keeping them as pets, until he saw an educational campaign about how keeping wild animals captive was actually against the law. "The policeman kept them in his house for a while, until ICCN [Institut Congolais pour le Conservation de la Nature] did a awareness campaign in the area about the law and how it is forbidden to kept wild animals in houses as 'pets,'" Itsaso said. "The policeman handed over the monkeys to the wildlife authorities, and they brought the two monkeys to our center." Makobola and Fizi's plight is characteristic of the nuances of human-wildlife conflict, which has existed literally since the beginning of civilization, as human beings started settling down and planting their own crops. Often, people don't even realize what is right or wrong when it comes to handling wild animals, even when they have the best intentions. When Makobola and Fizi arrived at CRPL earlier this month, rescuers rushed to give the scared little monkeys the appropriate kinds of milk and food so they could grow up strong. 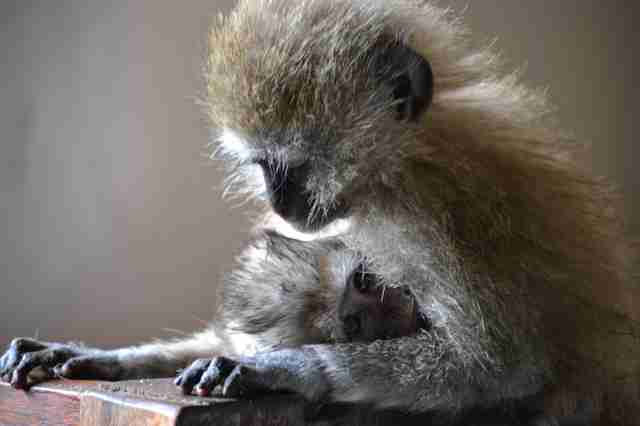 Fizi should still be getting nursed and comforted by his mom, but Makobola has stepped in to comfort him. "Fizi is still very much a baby, his teeth are growing now," Itsaso said. "They almost don't ever separate from each other. After losing their families, it's all they have." Soon, though, Makobola and Fizi will have new friends. 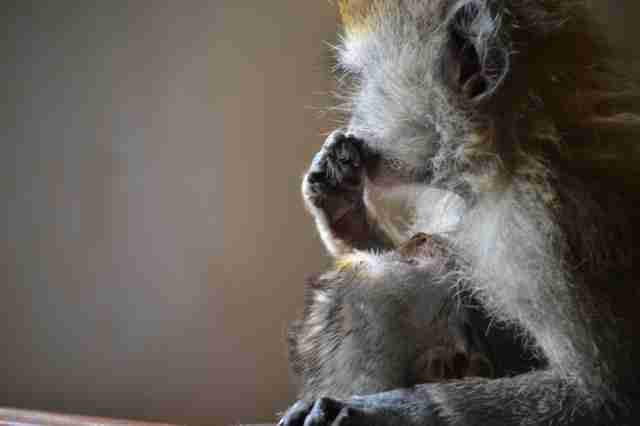 The other orphaned monkeys at the rehabilitation center can't wait meet them. To help Makobola and Fizi grow up strong, you can make a donation to the rehabilitation center.